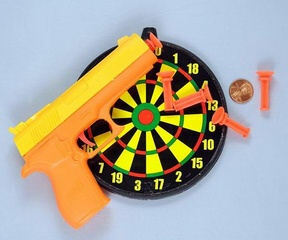 The U.S. Consumer Product Safety Commission (CPSC) has announced the voluntary recall of 1.8 million toy dart gun sets sold at Family Dollar Stores after they were involved in the asphyxiation deaths of two young boys. The CPSC issued the recall in cooperation with the Charlotte, North Carolina discount store. The importer, Henry Gordy International, Inc., of Plainfield, N.J. refused to recall the soft, plastic toy, which poses a risk if a child places it in his mouth. The defective toy can be inhaled into the throat and prevent a child from breathing. The toy was sold exclusively through Family Dollar Stores from September 2005 through January 2009 for about $1.50. A 9-year-old boy in Chicago, Illinois and a 10-year-old boy in Milwaukee, Wisconsin suffered asphyxiation deaths while playing with the toy, which was manufactured in China. No Massachusetts consumer safety problems have been announced. Consumers should discard the toys or return them to a Family Dollar store for a full refund. For additional information, contact Family Dollar at (800) 547-0359 between 8 a.m. and 5 p.m. ET Monday through Friday, or visit the firm’s website at www.familydollar.com. For more information, read the U.S. Consumer Product Safety Commission’s recall. announcement. Tagged: "Consumer Safety Alert", "Family Dollar Store recall", "Family Dollar Stores recall", "Massachusetts personal injury attorney" and "Toy recall"